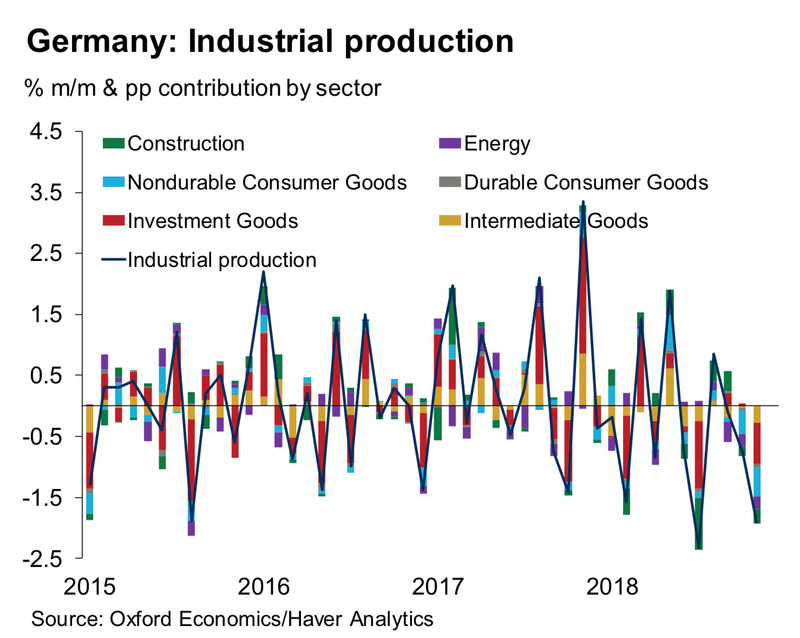 Germany may be in recession, economists said, after they trawled through an unexpectedly horrible set of industrial and manufacturing data published on Wednesday’s from the world’s fourth-largest economy. Germany’s exports fell -0.4% month over month in November, the government reported Wednesday. A recession in Germany could easily drag down France and Italy – the latter is already likely in a recession of its own. 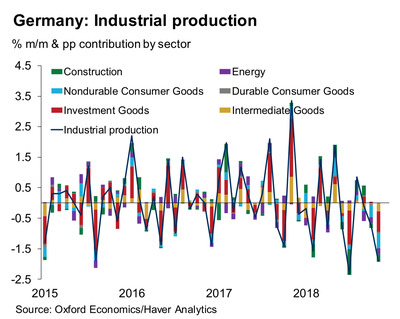 “Even if order books and backlogs of work still look good, Germany likely flirted with a technical recession in H2. We have revised our Q4 GDP forecast to 0.0%.” – Daniel Harenberg of Oxford Economics. “The decline was broad-based across sectors, with no bright spots: manufacturing fell by 1.8% m-o-m with the consumer goods sector once again being the major drag (-4.1% m-o-m vs. -3.3% in Oct.) … Today’s data were both bad and unexpected. 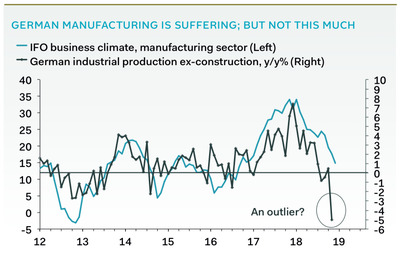 A technical recession in German industry now seems likely.” – Stefan Schilbe of HSBC. 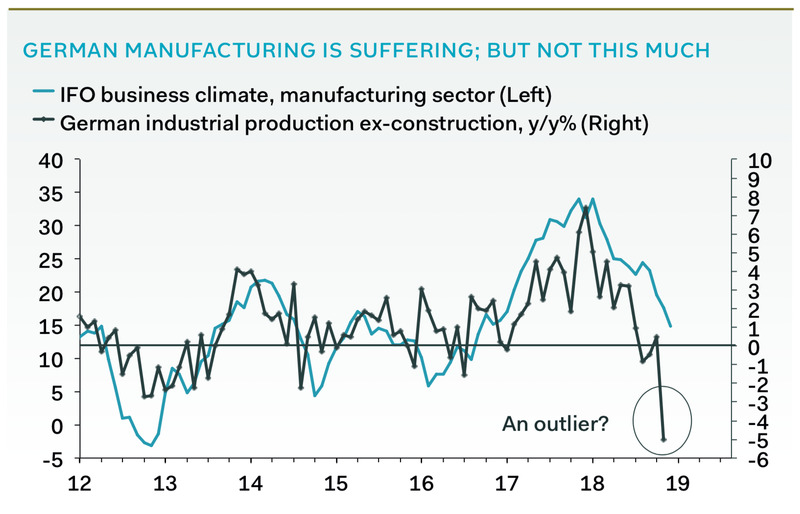 “Germany likely was in recession in H2 2018 … Yesterday’s manufacturing data in Germany provided alarming evidence of a much more severe slowdown in the second half of last year than economists had initially expected. Industrial production plunged 1.9% month-to-month in November, driving the year-over-year rate down to a decade-low of -4.6%. The headline was hit by a perfect storm across all sectors.” – analyst Claus Vistesen of Pantheon Macreconomics. The collapse of German industry was so steep and so sudden that Vistesen told clients he almost doesn’t believe the data: “The crash in the year-over-year rate is far in excess of anything remotely believable, at least using survey data as a yardstick,” he told clients in a note seen by Business Insider.